TAD volunteer John Clayton has come up with a clever solution to help people with limited body movement give food rewards to their assistance dogs. The treat dispenser was voted the Project of the Year by volunteers at the annual TAD conference. Assistance dogs can help people with disabilities by performing useful tasks but the dogs need ongoing training and reward for a job well done. Of course, food is generally the best reward. These dogs help people with all types of disabilities and sometimes the person doesn’t have the mobility or dexterity to offer a treat from their hand. Working with Assistance Dogs Australia John has come up with a clever solution. He has designed a button operated treat dispenser that can be used even by people with very limited movement. The dispenser can be fitted to any wheelchair without tools and the activation button placed on an armrest, headrest or blow switch. In designing this project John drew upon his knowledge of engineering, stainless steel welding, machining; lathe and milling, electronics, robotics and 3D printing. He also enlisted the help of a few fellow volunteers. The treat dispenser is simple and effective. “Doing the project has provided me with many hours of enjoyment and satisfaction,” says John. The final design is a is a small PVC barrel with a 3D printed internal auger arrangement. The barrel is rotated by a small 3-volt robotics motor. 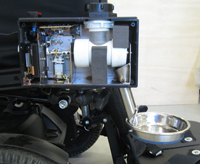 The device is housed in a plastic box with a ball-jointed swivel G-clamp for attachment to any wheelchair. John first trailed plunger and wheel delivery systems but found that stainless steel tubes either had jamming problems, could not be effectively sealed or required large drive motors and batteries to due to their weight. John says he encountered a few engineering and design challenges with this project. But through collaboration with other TAD volunteers, these were overcome. Assistance Dogs Australia will now be testing the treat dispenser and if successful they may suggest the design be more widely adopted.